Most of us want to practice our skill set, wanting to do what we trained hard to do. But in today's world, not only do you have to stand out and be a great coach, you also need to be great at obtaining clients. Of course, being clear about your target audience and what you have to offer comes first. It’s very important to understand we cannot be everything to everyone. As much as I understand the need to obtain clients and that we are often multi-talented, it is not a successful path to become a “thought leader” coach or create a following. 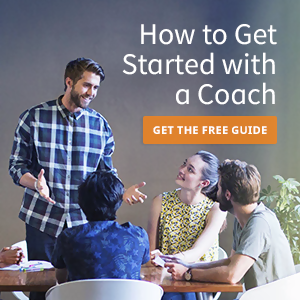 When it comes to being great at sales, it can be natural for coaches to put on their coaching hats. As a coach we are taught to listen more and ask great questions. This is also the perfect formula for building rapport and closing sales. Make sure you’re talking to a “right fit” client. The right fit will build your practice; the wrong fit can hurt you. A right fit cient is determined by three factors, demographics, ability to pay, and psychographics (their need and wants match what you specialize in). “Right fit” and wrong clients will attract more of the same, so I recommend to choose wisely. Talk less and ask more. The initial conversation is simply not about you. It is about establishing the prospects needs, wants and desires. Create a picture of what a solution would feel like to them. Coach them! What would it be like if they solved the problem, or better yet if they worked with you to solve their problem? We can often get past the, “I can’t afford you” objection by focusing on worth and value outcomes. One of the best sales closing techniques I know is to ask an open ended question, not a closed yes or no question. “Would you like to get started next week or the following week?” “Shall we book our first session or would you like to find a standing time?” Remember to keep the conversation rolling. The proposal can follow the exact same outline, making it easy for you to follow a conversation. Ask the questions, take the notes, and turn it into a proposal where the clients feel heard and excited about the work and results. Imagine if your prospect conversations turned into a repeatable sales strategy structure that closed sales! Shelly Berman-Rubera is a certified small business coach, an emotional intelligence leader, a lifestyle management consultant, and the founder and president of SBR-Small Business Results, a business coaching firm. It is the combination of her credentials and experiences that offers small business owners, entrepreneurs, and independent professionals a unique and inspiring business development coaching and program. Shelly’s strategic framework empowers small business owners who want clarity regarding their direction, marketing, and revenue strategy.